Basically it will be one long thread - but with the latest post at the top, and the quick reply box at the top. We'll still be able to quote people - but mainly it will be for us to just post what we've been up to game-wise. 2) Remove clutter from posting threads + make forum listing homepage - ie no more thread types, platforms, related games fields on submitting a thread, and the homepage would default to this http://www.gameslurp.com/gaming-forums.php (or we could make them optional - as I do like the 'official threads' tags. 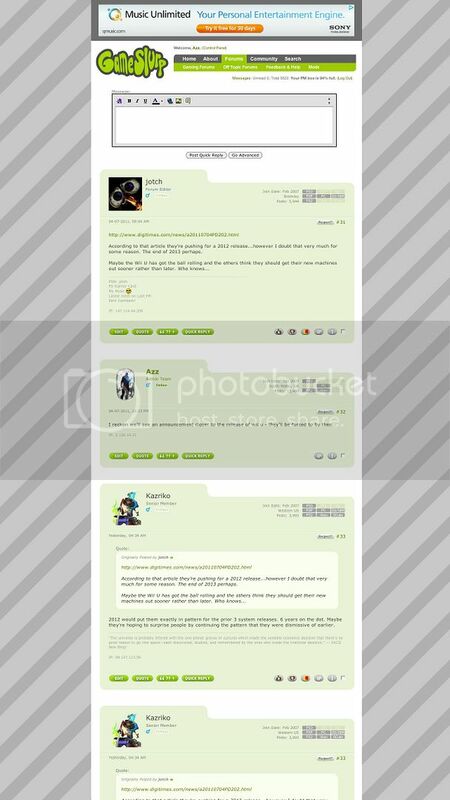 Off-topic and forum support posts will go in the same forum - no biggie really as the others don't get many posts. All sounds good to me...I like change and the fact that it might attract more people to start posting! I think we can drop the rep system too - it never really worked - we'll just have a stricter door policy, if people act like knobs we'll just ban em. I think keeping GS as an exclusive/private community is going to be best (I doubt any of us want to turn it into a troll site - like those we came here to get away from). We'll replace rep with a 'like' button instead (tried it on another forum and it went down well). Ok guys - I've done the first iteration to get it up and running! At the mo the quick reply box sends you to a full reply, as I can't seem to get the stupid quick reply thing to work but it still feels ok - what do you think? Looking forward to seeing what you lot get up to! What does everyone think of the new homepage/system?